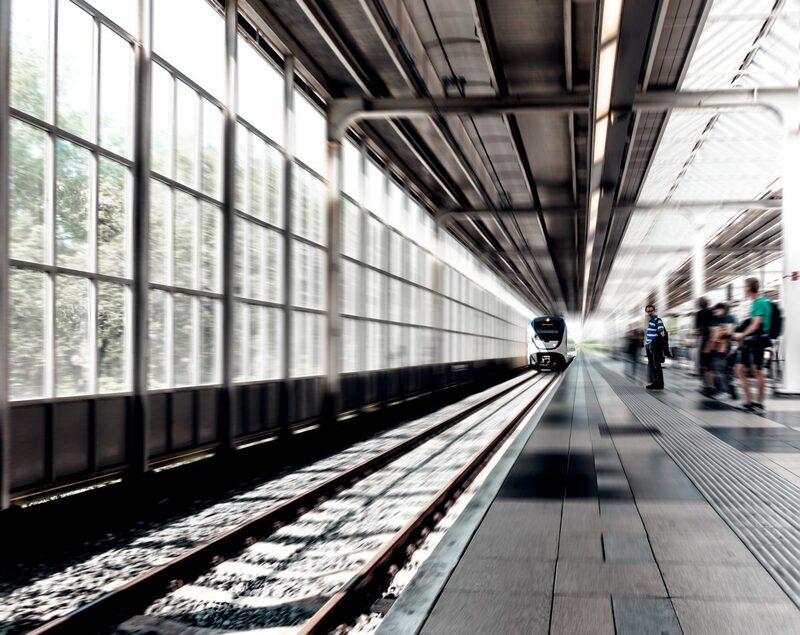 What would you do, if somebody asked you to develop a solution that prevents people from falling down onto the railway tracks – and where would you even start? Most people would likely counter the accidents by means of automatic doors, only granting access when the train has arrived. A recent study from Japan, however, reveals that a potential solution might be found elsewhere on the platform. Collisions between a train and a person is the most common cause of death nearby railroads in Denmark, as well as the rest of Europe . Thus, BAR transport og engros reached out to iNudgeyou to identify problematic behavioural patterns along the Danish railways. BAR transport og engros is a Danish work environment council, for promoting occupational health and safety in the transport and wholesale industry. The project resulted in a number of solution concepts to reduce accidents near the railway tracks. In this blogpost we will present one particular behavioural pattern and the corresponding solution concept. Often, people think that collisions happen in situations where a person has strayed onto the rails. However, in reality, collisions arise in numerous different situations. Some accidents happen when people walk too closely to the platform edge during crowded peak hours. Others, happen due to people being overly preoccupied with their smartphones. Thirdly, some graffitists may not hear the train rumbling towards them on the rails. A thorough understanding of the behavioural pattern is considered an important prerequisite for developing appropriate nudge countermeasures. This advice is very well demonstrated by a study conducted in Japan. In 2012, West Japan Railway Company experienced an increased number of collisions near railroads . Consequently, the railway company was particularly determined to work hard to reduce the number of collisions. Based on a vast amount of surveillance footage of the accidents, investigators were able to recognise a specific behavioural pattern that appeared to be one of the major causes of the accidents. According to Japan Times, 1900 out of 3300 incidents, involved people that had been drinking alcohol. Moreover, 60 % of these 1900 accidents were drunk people who had been sitting on a platform bench, and then suddenly had risen and rushed forward onto the rails, making this a distinct behavioural pattern. In order to prevent drunk people falling down onto the rails, West Japan Railway Company has tested the effect of rotating the platform benches by 90 degrees. 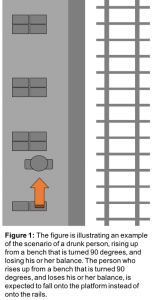 The idea is that the drunk train passengers who lose their balance, will fall down onto the platform instead of onto the rails (see figure 1). A solution like this one, is an example of how a systematic behavioural mapping can provide important insights leading to new nudge-solutions. This solution is only one of several initiatives, which are described in our new report on nudging safety by railway tracks for BAR transport og engros. In the report, you can read more about how we mapped and analysed the behavioural patterns nearby Danish railroads and developed possible solutions to tackle the identified problems. If you are interested in reading the report (in Danish) and getting some inspiration, you can sign up for our newsletter. Then you will receive a notification in your inbox as soon as it is published. Havârneanu, G. M., Burkhardt, J. M., & Paran, F. (2015). A systematic review of the literature on safety measures to prevent railway suicides and trespassing accidents. Accident Analysis & Prevention, 81, 30-50.